The State of Florida, fined me $25,000 - $5,000 each for three counts of claiming to be an architect and two counts of claiming to be an interior designer. The charges were a direct result of a Green Room I designed for the Latin Billboard awards project. An article was written about the project, referring to me as an "award-winning interior designer" and stating that I used crown moldings to embellish interiors. The state interpreted that to mean that I considered myself an architect. It took us two years and $10,000 to fight and prove that this was unwarranted and that I didn't even have anything to do with the writing of that article. Interior Design Protection Council (IDPC) and Institute for Justice (IJ),helped to reverse the Title Act in the state of Florida at the beginning of this year. Please do not think that the fight is over. States across the country continue to attempt to pass such laws, acknowledging that enforcing the Title and Practice Acts is nothing short of a "witch hunt." Even though I proved everything was not true and that I was fully in compliance, I still had to pay the state $2,500 for their time. States hire outside legal firms that aggressively interpret the law, fining and disciplining members of the design community that are just trying to earn a living and have not done harm to the public in any way. In a two year period, over 600 Florida interior designers were dragged through the same process. I want to thank you all for the great welcome to DSA. It has been a pleasure getting to know some of you this first month, and I look forward to working with all of you in my role with Member Relations. This month is marking the beginning of a few new things at DSA. We are featuring a monthly portfolio campaign, coordinating a new membership drive and launching the initiatives for our state-wide chapters. Also, DSA is now on Facebook. If you have not taken advantage of our free online portfolio, I encourage you to do so. This is another tool to market your business and display your work for potential customers. Let your talent speak for you! We will have a drawing in April for one active member who has an online portfolio with photographs, posted by March 28, to win a spotlight in our June newsletter. The winner will also be featured on the home page of our website for the entire month of June. So take advantage of the free portfolio and the chance to win free advertising for a month. We want to grow to become a strong force in the industry and need your help. I will be sending each member a packet of information about DSA. In this packet is a form for each member to fill out with the names of 10 fellow designers who are interested in membership at DSA. If you return these 10 names, your membership will be extended for two months. If five of the designers you suggest join DSA, your next annual renewal is free. Starting our chapter groups is a high priority for us this year. If you are interested in heading a chapter or helping with the coordination of your state chapter, please contact me. We are looking for strong leaders who want to help with the vision of being a united force in the interior design industry. I also hope you will check out the Designer Society of America Facebook page and become a fan. I know with all these initiatives in place that we can build a strong membership resource. I also want to know how we can better serve our members. Please feel free to contact me with any suggestions or comments at karen.gleason@dsasociety.org. Again, I look forward to working with each one of you. The society designed with you in mind! Dorothy Draper (1889-1969), was America's first female interior designer, and she turned the establishment on its ear with her outlandish use of color, texture and ornate fixtures. This forward-thinking woman was the Grand Dame of using bright, bold color and texture combinations in her decorating of socialite homes, hotels, offices and hospitals. Though to many people Draper's work was a sensation, the legendary architect Frank Lloyd Wright called her "the inferior desecrator." Despite Wright's dislike for Draper's style, her influence can still be seen in color and textural combinations throughout America and the world. Draper loved to use color in her decorating, departing from the dark color schemes of the usual Victorian-inspired decor. She was one of the first decorators to believe that vivid, beautiful colors helped people feel happier. She favored using such dramatic color combinations as green and red with coral, or black and white with bits of color thrown in for emphasis. It is said that she suggested the Howard Johnson's orange and blue color scheme, which is famous even today. Draper also mixed different fabrics and textures to make a bold statement. She was the first to combine strong stripes with grand cabbage rose floral material. She loved oversized details, like huge mantels, ornate moldings and lots of mirrors. One of her mottos was, "If it feels right, it's right." True to her words, her often theatrical combination of colors and props, such as a birdcage chandelier, somehow worked, leaving people with a larger-than-life feeling. Dorothy Draper was famed for many decorating achievements, not limited to New York City's Hampshire House, the dining area in the Metropolitan Museum of Art and the lobby of the Carlyle. She also decorated the entire Greenbrier Hotel in West Virginia and the Camilla Restaurant in the Drake Hotel in Chicago. She authored two successful books about decor and decorating, and was invited to decorate airplane and automobile interiors. Not bad for a woman in an era when women were typically little more than homemakers! Even though Dorothy Draper designed and decorated more than 50 years ago, her influence can still be seen in interior design today. Modern decorators believe in her notion that color is mentally beneficial as well as fun. Benjamin Moore created a collection of colors reminiscent of Draper's signature paint colors. The 15 chosen capture her keen usage of color and self-assured sense of style. With fun, evocative names like Nightfall 1596, Apple Green 2026-40, Gondola Ride 602 or Jamaican Aqua 2048-60, it's easy to see why a paint palette honoring Draper would be successful. Even furniture makers and decorators are copying and promoting the "Draper Touch." Thomasville's magazine, "Dream," shows how to achieve a modern-day Draper sitting room. Teaming large-print cabbage rose upholstered furniture, bold paint schemes and over-scaled elements help to capture the unique flare for which Draper was famed. "New York" magazine's article, "The Draper Effect" by Wendy Goodman, lists six different points you'll need to incorporate into your decor if you want to channel Draper's vision: intense color; plant life; dense, textured carpet; striking details; a roaring fire; and exuberant prints. How do you apply these points? First, abandon pastel colors and neutrals and head for bright, bold and vibrant colors instead. It will probably be something you'd never dream of putting on a wall. Draper loved intense colors on walls and floors, such as the turquoise lobby of the Hampshire House. She loved using live plant life and florals in her rooms, though silk plants will do if you lack a green thumb. 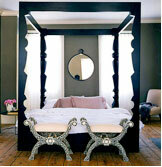 Select big, bold, ornate accent pieces such as a baroque mirror. Textured carpets with gorgeous detail are important too. Though Draper liked boldness, she didn't like clutter in a room, so get rid of the shelves full of knickknacks. Finally, you'll need to throw a slipcover with a huge floral print and details such as satin cording or fringe on the sofa and stoke a roaring fire in the fireplace. Then your room will look the way Dorothy Draper would have envisioned. Business Building Blocks: Are You Connected? Who is their favorite sports team? Do they have a favorite restaurant or food type (Italian, Mexican, Chinese)? Where is their favorite vacation spot? Do they have a fantasy destination? What school are their kids in? What college did they graduate from, or are the kids headed to college? Yes, you can include politics and religion, though I don't generally recommend it unless you meet at church! Interestingly, I have found that most of my clients share similar political views - like attracts like. We are graduates of the same university though different majors and years apart. We are both from the West Coast, though I was Southern California and she was Northern. One client attended the same boarding school as my younger sister, years apart. I've been to Africa on safari and it was on my client's list of fantasy adventures. We both love Hawaii and can share places to go. We share a love of art and museum trips, having met on a bus trip sponsored by a museum. Personal points of connection set you apart and allow your clients to connect with you beyond business. In this age of hi-tech and low touch, business is all about reaching out and touching in real time, not just cyberspace. It is the same reason everyone watches reality TV shows; they want an inside peek at someone else's life. When you allow your client's to know you better, you deepen your bond and provide a greater investment in the relationship. Remember, women often bond over boutiques, so if you can compliment her on something she is wearing, and be genuine in that, you'll gain a new resource and get that much closer to a new client. (In the world of social networks, aka business strategic networks, photos matter!) Men bond over sports, so if you share a love of the same team, go for it. If, on the other hand, you are a rival, be diplomatic and keep your sense of humor. Allow your clients a glimpse of your life beyond business; it will make you much more real and possibly irreplaceable! Last month I gave a brief overview of the book "Silent Spring." It provides a strong foundation in understanding the sustainability movement. 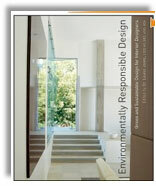 This month I'm recommending a reference book that can provide a foundation for understanding sustainable interior design. "Environmentally Responsible Design - Green and Sustainable Design for Interior Designers," edited by Dr. Louise Jones, is a comprehensive textbook - yes, a textbook - and I am recommending it. It's not the kind of book you're likely to curl up and read straight through, but the contributions of many authors are gathered together in a cohesive guide to both the history of sustainability and detailed information necessary for interior designers. It's a comprehensive reference resource for students and seasoned professional interior designers. Designers new to sustainability will find plenty of background and basic information. Those familiar with the concepts, processes and product alternatives will find important reminders, as well as more in depth technical information. The first two chapters offer a global sustainability perspective and then an historic one. Chapters six and seven, regarding lighting design and HVAC, are examples of important reference sections. The timeline of human and environmental interactions is easy to scan and gave me new information, as well as a better understanding of how events are related to each other. The book concludes with two case studies. The first is the renovation of a 376,000-square-foot building used to house the Order of the Sisters of the Immaculate Heart of Mary. The second is a 75,000-square-foot building on the campus of Eastern Michigan University. Each gives detailed insights into environmentally-responsible design decisions. Black and white photographs throughout the book help tell the story and keep the cost of the book more affordable than the use of color photos. We rely so much on the Internet for information. It's helpful to be reminded of the value of a good reference book. "Environmentally Responsible Design Green and Sustainable Design for Interior Designers"
While reflecting on an important event that led to our country's valued liberty - the Boston Tea Party - I was surprised to find many comparisons that could be applied to the current push for interior design regulation. Like Great Britain of old, ASID is large, powerful and militant. Both chose to serve as the partner to select businesses and groups useful to accomplishing their purposes. Both dismiss the injustices they create as collateral damage for the "public good," while refusing to acknowledge the destruction of lives they leave in their wake. Great Britain's Tea Act was supposed to solve problems, not inflame them. 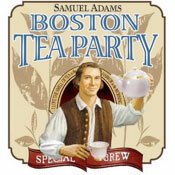 But passing the Tea Act granted exclusive marketing privileges and created a monopoly. It was a violation of freedom and resulted in the mobilization of large segments of merchants, traders and activists. Interior Design Practice/Title Acts create a similar negative environment. They have the capacity to put hundreds of thousands of designers out of business or place them at an unfair competitive disadvantage. Such laws do not serve any public benefit, but instead create a monopoly in which only a small handful of elitist insiders would have control of all the business. These laws are anti-competitive, unnecessary and unconstitutional. We are all painfully aware that times are tough right now even for the businesses that have never had a problem before. Interior design services may very well be at the bottom of the priority list for most homeowners right now, and many of us are having to work even harder to keep our existing clients, let alone seek out new ones. With that being said I'm here to tell you that this tough economic period could very well be the best thing that ever happened to you! Ok, now that you think I'm nuts, I have your attention. Read on and prosper. It's probably a good time to take a look at how to run a better business. (But hey, when is it not a good time?) This economy does not leave room for you to succeed in interior design unless you are a relentless warrior. If you are doing things the same way you were even 90 days ago, it is time to do some careful thinking and strategic and creative planning. Take a deep cleansing breath and get ready to reclaim your passion for the wonderful field that we are in. Attitude, attitude! If you are depressed or feel defeated because the phone isn't ringing, clients are holding off on orders and you can't control your negative feelings, you might as well burn your fabric swatches and give the studio key to your landlord. Stand up and prepare for battle! If your attitude is negative, it will reflect outward and come back at you like a boomerang traveling at warp speed. Motivation and time management. Being "busy" doesn't mean you are making money. If you don't carefully manage your time, you will end up working hard but not produce monetary results. Could an assistant or intern be doing the small stuff so you can be out closing the big deals yourself? Are you spinning your wheels with small projects that require too much running around? Are you planning your travel carefully and grouping together consults that are in the same part of town? Your expenses. Think about what sample books you really need to buy and which lines are most profitable for you. Of course, all designers want to sell high end goods but consider offering a mid-priced line of fabric, accessories and furniture as well as high end. What buying trips do you really need to take? Going to market is something we all look forward to, but there are a plethora of other resources designers can use to cut down on traveling. I'm not saying you have to give it all up completely, but try to minimize non-essential expenditures. Spend wisely now and there will be plenty of time to have the extras later when you sign those big clients. Your business skills. If you aren't constantly improving your skills, especially with technology and today's marketing techniques, you will be facing a difficult decision very soon. Your budget should include at least 3 percent for continuing education every year. That can mean a seminar or even just reading a new sales book. Educate yourself! Taking a new class or seminar doesn't always have to be directly related to interior design. Motivational seminars, color theory, art history, even spiritual or new age seminars can offer bits of knowledge that can help us grow in all areas of our lives. How well are you doing? "Nitpick" your business and ask yourself "How am I really doing and what do I do best?" Where does the bulk of your profit come from? How could you work smarter and not just harder? Having fewer clients right now allows you the time to step back and really gain a new outlook on how you can strengthen your skills and your business, so accept this task. Do you need more sales experience? You can be the most talented interior designer in the world, but if you can't negotiate, ask for the sale, close the sale and add on sales then you are missing huge profits. It's time to specialize! Today's potential clients are extremely educated and, due to our economy, they are choosier than ever. As a designer, what makes you and/or your design business so special? What do you believe really sets you apart from the rest? Think about that and use it to your advantage to tailor and streamline your skills and your business. Have you ever been to a restaurant with an enormous menu but the food was just mediocre? Case and point - more services do not always mean a superior or more successful design business. Yes, this will take thought and creativity, but this is the stuff great designers are made of. Networking as an art form. Networking is a practice that almost every business person in any given field is familiar with. The question to ask yourself right now is "Am I doing it right?" Networking is not just about attending a function and passing out business cards, nor is it about joining a business organization and going to a meeting or two. I liken it to an art form and suggest that it should not be taken lightly! Networking is about really connecting with folks that could make a difference for you both personally and professionally. Choose the function wisely. When choosing which networking events to attend, consider who will be there and whether the event could lead to valuable connections. I'm not saying you should be a snob, just do your homework before blocking off valuable time. Don't be too quick to rule out an opportunity. The networking event does not necessarily have to be design related. Even if it's a church function or your spouse's business event, you never know who you will meet and who they might know. My largest commercial job came about because my husband was a scout leader along with the owner of a large local restaurant being built and we met while serving mac and cheese at a badge ceremony! That job later lead to a referral that resulted in my second largest commercial job. Volunteer or help someone. Networking can be accomplished in more subtle ways as well. Whether it is an organized charity or a simple and random act of kindness, good karma will always follow you. Three years ago I was having lunch with my son at a KFC and I ended up helping a woman clean up her large spilled soda. We ended up chatting and it turned out that she was redecorating her entire home, and her husband needed a designer for his new 6000 sq. ft. office building. That project is still my largest to date and has resulted in many referrals. Referrals, referrals, referrals! If you and/or your company spend money on marketing and advertising, you know how expensive it is. No dollar amount can be placed on good referrals. Are you receiving them? If the answer is no, then there are two possible reasons. Either you are not asking for them or you simply don't deserve them. I know it sounds harsh, but it's time for tough love. If you are spending money on advertising, then evaluating your referral rate is extremely crucial. If you are not getting at least one referral for every completed project, then you might as well through your advertising dollars to the wind because every new client gained from advertising should be a two for one sale. Most importantly, you must remember that a referral is a gift and is in no way owed to you. You must earn it and you must reward your client for giving it to you. If you adopt even two of the suggestions offered above, I guarantee that you will see results. You can allow yourself a very brief "pity party" if things are slow for you right now, but don't you dare allow yourself to get kicked down for the count. Get up, get going and get busy. And if you don't know how, get help!